Macro Man has had a death in the family, so posting will be sporadic over the next few days as he will be away for some of the week. With the US and UK looking at a bank holiday next Monday, this week may well focus on position shuffling and risk reduction ahead of the long weekend and subsequent month end. The weekend G7 meeting ended with little to show for it but stories of a catfight between the US and Japan as to whether yen moves have been sufficiently disorderly to potentially warrant intervention. Although the US habit of lecturing the rest of the world is no doubt grating, in this case it's easy to argue that they have a point. 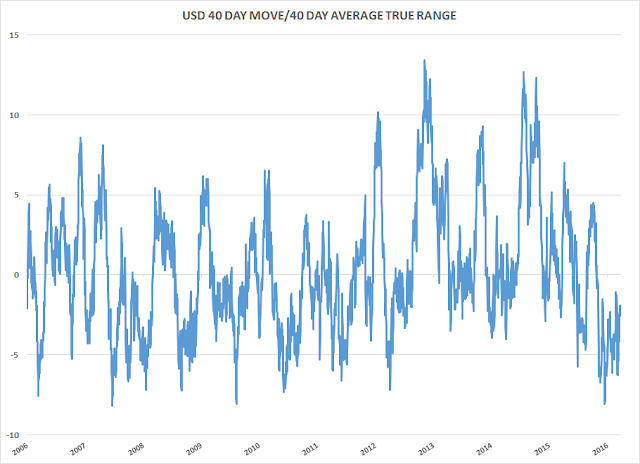 If we compare, for example, the rolling 40 day change in USD/JPY with the rolling 40 day average true range, what do we find? That recent price movement has been relatively well behaved. Indeed, the real evidence of disorderly shifts in the yen came during the height of the Abenomics/"BOJ on speed" phase of a few years ago. My most sincere condolences, MM. V sorry to hear MM. Condolences to the family. Sorry to read about your family's loss. echoing the crowd, my condolences as well. Assuming it wasnt a surprise death (otherwise you wouldnt have posted) so hopefully they lived a long life and remembered well. USDJPY making lower highs and lower lows. and EURJPY has been doing it for over a year. No reason to assume it stopping anytime soon. Condolences, having had one of my own 2 weeks ago, I know what it is like. ...Condolences MM....but in my travels today, like most Mondays, I read Hussman, and this had already occurred to me. It seems like the Fed and other CBs are not going to change the narrative here, but super-low interest rates are stealing wealth from the lower 75%. Already we see more elderly people working, and won't or can't retire. Afraid of equities, and now getting nothing on cash equivalents. Pensions are diving, and not just Central States. We might not like thinking about rate increases, but they might be the only way out. You might recollect that aeons ago I warned of the zero sum effects of QE ! That in point of fact to some degree all we were seeing was in fact a swap. A swap between fixed incomes and capital values and if you were to dig deeper into that you would find a secondary effect was ..... people were being squeezed into working longer thereby exacerbating the so called policy effect on closing the labour gap and in doing so would also be depressing labour costs. The whole QE policy doesn't work the way central bankers think it works. Indeed given they said early on they were not sure how it was gong to work has a policy then perhaps they would be wise to unwind it sooner than later. Sorry to hear sir, condolences. Not wanting to clutter this post up with market rubbish in the face of more important things, however I believe equities are breaking out to the upside today across the board. Playing accordingly. I believe MM would want us to Carry On Commenting, in general. We add our best wishes and condolences to those of others. So, we have a little spike in USDJPY today, but we have used this move to start a small short in the pair. We took profits in short EURUSD today, but we remain long USDCAD. We view the combination of USD and JPY strength as a bearish FX indicator for equities, and they are both looking really strong against EUR at the moment. Interestingly when we have seen heavy spikes in EUR and JPY buying that has been the most bearish sign of all, presumably b/c carry trades in both are then forced to unwind. In general we remain dollar bulls but it's possible that the dollar's run takes a little breather here until further weakness in EMs and commodity currencies spurs the greenback to new heights. Dame Janet, La Paloma Blanca, speaks on Friday. Nice piece by Michael Gayed today to the extent that if the economy can't withstand 25 bps we are in bad shape, and the Fed had better hike so that they have ammunition for any future problems. Many of the same sentiments expressed here by MM. What an interesting day in equity land. Europe did the heavy lifting after testing the lows for May in the Dax & Cac. Euro swooned and market lifted. You wouldn't know by the price action that DBank was in bother again and the French were on all out strike & had no fuel to drive anywhere. FTSE ripping against a large cable bid too. Europe/US allocation ahead of FED? Market appears to remain resistant to a FED hike, and warning of 2 or 3. "What an interesting day in equity land. " Indeed, things got going all of a sudden! Here is an idea for you that LB, and others have been musing about too. Spread compression/curve steepener in Brazil! So yields have already come down from 16 to 12ish, but the curve is flat as a pancake. With inflation falling, AND a stronger than expected improvement in the CA surplus, surely there is juice in the front-end here. Meanwhile, despite the good day in equities, it still one step forward and one backwards at the moment. But bears have no joy so far. "Market appears to remain resistant to a FED hike, and warning of 2 or 3." What if, it is accepting a rate(s) hike? Everyone is assuming a risk off in US equities, if there is a hike... Which if you think about the money flows, it should imply the opposite. Europe is as predictable as a baby's arse as you have mentioned, whereas US is stable. Be interested to hear views on this. Markets will rise on rate hikes and dollar will fall. Negative interest rates.... Equities and dollar will rise! New home sales today was 619k.... actually that is 50,150 homes sold in the month - and then they multiply by 12. Noisy data series 101 - means very little really, you go from 40,000 to 50,000 and the headline number leaps from a mundane 480k to whoa baby 600k - so that any hiccup in counting a rather small monthly number then gets massively amplified in calculating the annualized rate. I could go on - but the cognoscenti here will have absorbed the point that I am making half way through the first line. 2s are well on the way to 1% and 10s are on the way to 2%. After that, things will get interesting. We are still short CAD and watching the price of WTI. Those two usually go hand in hand but CAD has been leading the way down while WTI grinds stubbornly upward. Someone is wrong. USDJPY 110 level was quite firm last time. Let's see if that holds again and the yen bears are rejected once more. That's a very very popular FX retail position at the moment, and you know how good Mrs Watanabe is at these things... as for EURUSD it will definitely head lower, but not for a while perhaps. I guess I don't have to tell you that they are a leading indicator. Just booked profits on 50% of multiple equity long positions. From time of posting yesterday (above) to now, Dax is now +150pts higher, EStoxx/CAC +50pts, Nikkei +200pts, SPX +15pts, Dow +100pts. My entries were lower, but for the sake of this discussion will only count from where I posted. Running the rest with break-even stops. Do you have a target on the spx jbtfd ? Punta - Not really. Like everyone else, I'm eyeing 2100 and then a break to all-time highs, however this upmove has been rapid, and a pullback wouldn't surprise me. If we pullback too heavily, I'll likely close more (or all) of the position to preserve profits. "but for the sake of this discussion "
What in heavens name makes you think this could in anyway be defined has a discussion? Checkmate - jbtfd was asked by other posters previously to give them a heads up when he goes long/flat/(?short?) - jbtfd said yes and is just doing what he promised. And back to my question, exactly how is that a discussion? Perhaps he should say for the purpose of the statement . Now that might be accurate I suppose. jbtfd great call - and punta, to checkmate's point, while most on this board would prefer to learn why jbtfd chose the target instead of what it was, politely sharing the latter is more than welcome of course. Just took profits on another 10% of the position (this market is going vertical - Dow up nearly +100pts since US open). Adjusting stops also. We have added to our yen long today. It seems as though we are the only punters on the planet who believe USDJPY can fall from its 3 month high around the 110.00-110.50 zone, taking with it risky assets. Some rumblings out of China just now, so keep an eye on USDCNY, if the yuan is fixed lower from here, yen will be bought in Asia's favorite risk aversion trade. It would be too funny if crude kissed $50.00 for 10 nanoseconds and then turned around after the supply data. How many times have we seen markets do that? Algos like profits too. Jbtfd is riding a squeeze. Good luck to him for spotting an opportunity, although it may be short-lived, spot VIX already low. Options expiry in Brent today LB so should be plenty of action after the figure. Ok took profits on more... 25% of original position left. Oil news coming. Let's see. WTI spiked to $49.62. Close but no cigar this time. We are fresh out of "Nigerian incidents", I believe. Markets top on Good News (one of Polemic's aphorisms). Why? Simply b/c there are no more buyers. you are not alone in positioning for risk off. We hold the view that risky assets have low return in 0/- rate equilibrium, so "buy the dip" and "sell the top" will be just profitable, until well Fed hike. @Left/@City missed in recent conversations is the need for AAPL to close its earnings gap down price move from 102 to 97 - I would like to know from the more technical folks here whether the rally today does indeed meet that requirement. I know AMZN is the new AAPL, but the broader equity market participant is still stuffed to the gills with apple, and it still carries heavy weight in nasdaq and spoos. So, why did spoos ramp 30 points yesterday? Well, let me give you a hint, it had nothing to do with the amazingly strong housing data! But that said, the 16.6% increase in new home sales combined with the recent IP, retail sales and CPI data should have all the eco-hating doomers rethinking their calls for immediate recession/depression. The real reason spoos ripped is because the Chinese are not ramping the USDCNY fix in the face of a hawkish pivot from the FOMC. Since the hawkish Lockhart and Williams comments early last week, and the hawkish minutes midweek, the USDCNY fix moved higher by less than 0.5%. And with no dovish offset from either the Dudley or Fischer speeches late last week, followed by an extra-hawkish maneuver from Harker to start this week, the USDCNY fix was still little changed. All told, from early last week to today we have only gone from 6.52 to 6.56 in USDCNY. Furthermore, USDCNH is currently trading BELOW its pre-minutes release levels, and well BELOW its post-minutes release spike. The bottom line is that the DXY is rallying on a more hawkish Fed, while the Yuan is hanging tough! However, well-behaved Yuan price action is not the only driver. The article released yesterday morning in the WSJ by Lingling Wei highlighted that the PBOC is not likely to follow its previous response path to DXY strength. Read the article here - A Rare Look Inside China’s Central Bank Shows Slackening Resolve to Revamp Yuan - WSJ. It's a fascinating (and well-sourced) look into the current PBOC thought process. The overall implication is that spoos are repricing higher as the odds of another Chinese-led August or January rinse diminish. If Zhou is giving Janet a little breathing room to get on with some needed normalization in US monetary policy, then the outlook for spoos is far more stable. The fat tail risk of a Chinese currency led 15% dump in spoos just got skinnier - so the expected forward value of spoos just rose. Et voila the 30 point pop (with an extra 8 on the top this morning for good measure). Of course, just because the Chinese are willing to give the DXY (and Janet) some extra wiggle room doesn't mean all the downside risks for spoos are gone. The Chinese could easily send a different message if the DXY were to rally too much. But for now it appears the Chinese are playing a little nicer. It is now up to Janet to use this window of opportunity to cautiously take another small step towards normalization. And to be sure there exists plenty of room for error on a move towards slightly tighter US monetary policy. But this ostensible Chinese blessing for a small FOMC rate hike is (on net) a positive development for US risk assets. Good luck trading. Abee, squawks and twitter were abuzz with China requesting the FED hold off until July. Imagine that, the Chinese telling FED what to do. Qatar to Raise $9 Billion. Oil bonds. CADUSD filled a gap today, and so we added to our short after it popped a little on the BOC (non-)news and then there was a small squeeze. We also added to short USDJPY - so we are synthetically short CADJPY. China.... or The Lord Voldemort, as MM used to say, he who may not be named. This quiet period right here would be a very convenient time during which China can move to stealthily fix CNYUSD lower, but not in a lumpy fashion as they did last summer. Let's imagine, though, that the Fed does indeed hold off until July (we agree, by the way, b/c of the Brexit risk). Does that mean that DX can't rally again, perhaps substantially, in the interim? Dame Janet may say "we're not doing it in June, but we are doing it twice this year (July and September)", and Bucky would be off to the races. There is also the other possibility, that the Fed decides not to hike because of economic weakness, and the market sells off risk assets anyway. Any unwind in the great big commodity carry trade between now and July would also be USD and JPY positive. The reflationary canaries in the coal mine are already signaling that this phase is done - metals and miners have already given up and rolled over, taking AUD and most of the EMs along with them. Crude, small caps, high yield, cable and CADUSD are also a part of that one big carry trade, and when it unwinds there is going to be a mess in the bed. None of that actually requires a Fed rate hike, it can happen all on its own, but a slow grind up in the dollar would probably accelerate the end of the ride. Look for the usual carnage in other petrocurrencies like NOK, RBL and BRL when the reflationary bubble begins to pop. Speculative longs in crude are at a record high. It's been a one-way market for months. We are being told that the dollar is irrelevant, storage is irrelevant, "it's different this time". Supply is everywhere, Cushing, offshore vessels stuffed to the gills.... as soon as the speculators can't make money in offshore tankers, then the stored inventory is going to have to be sold. This is all oddly reminiscent of the late phase of the 2008 oil price spike, $WTI reaching $145 on extreme leveraged speculation before declining to $45 within 6-7 months of the peak. A repeat of that unwind would lead to sub-$20 oil, at which level of distress there would be the wave of bankruptcies, liquidations and M&A that the energy sector probably needs at this point. I don't get your crude hating. US production is now 900k off the highs. Supply disruptions elsewhere, demand has grown. The market is basically in balance. Inventories are starting to draw and the market is going to trade off the perceived supply deficit that grows substantially next year. So why should crude fall unless there is a severe global growth scare? Base metals fall because they will be oversupplied for the next decade as China builds less. Energy won't be oversupplied until rapid switching to electric vehicles occurs. Current capex cuts will lead to significant supply deficit. Shale is 90pct dogshit and misrepresentation based on outspending cashflow because equity markets (currently) reward that behaviour. @anon 11:00 - all the factors you mentioned are reflected in the flatness of the curve, where the cal 16 vs cal 21 spread has snapped in since the feb lows - flat price in crude, however, has always been determined first and foremost by portfolio flows (in the last two decades we've been contangoed at $100 during periods of oversupply and backwardated at $15 during tightness), and left is correct in observing the money flows, especially CTAs have gone one way for the last 3 months - I'd be careful in applying the S/D story in formulating a view on flat price, but they are relevant to spreads no doubt. I think lower for longer personally just based on waning interest in owning commodities as an inflation hedge, but in the ST crude is reminding us that its a champ at getting into self fulfilling trends, so who knows we will see. The biggest mystery to me is how crude is doing a moonshot even as the long bond hovers near all time highs - one of these markets is very wrong. One of these markets is very wrong. Look up 30 year bubbles- the long bond probably has it's picture in the dictionary there. Maybe it used to be the smart money. The flatness of the curve indicates quite the opposite - the market expects too much supply out there, which seems unlikely barring a demand shock. The curve is likely to remain flat as the perennial hedgers, Shale, will hedge on the way up in order to lock in oil prices that ensure their stakeholders will have another year (2017) of negative returns. At some point the valuation model may change from perp growing (every shale producer becomes exxon, and their EURs are legit) to 4th quartile swing producer DCF, which unfortunately gives a valuation 1/5th - 1/10th of current prices.